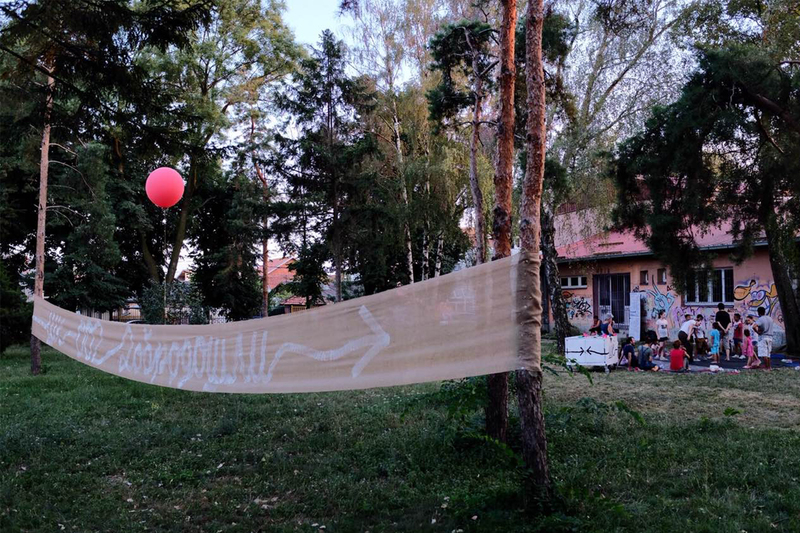 From 8-12th of August 2018. in the schoolyard of OŠ “Vlada Obradović Kameni” team Škograd has organized 2nd summer school called Schoolaboratory 002. This program is intended for children of Ledine from preschool to upper secondary school age, for those who are enrolled or those who are early school leavers. About thirty children participated in the workshops each day. Workshops were dedicated to designing interventions in the schoolyard thorugh questioning play, music and learning. Intervention in the playground was drafted and design of the open classroom was completed. This open classroom is planned to be built as an Urban hub 2 project in cooperation with BINA and Shared cities, Creative momentum platform in a Creative Europe program. Aim of the Schoolaboratory 002 was to gather citizens of Ledine around the idea of enhancement of the public space and their communal gathering place which this schoolyard already is. It is why this year adults also participated in the summer school. Parents and neighbours created dicactical wall for youngest children of Ledine and also launched first neigborly assembly. Didactical wall was created entirely from recycled materials and was designed with young mothers Sandra, Slađa and Ivana. It is a tool that serves development of senses, logical thinking and motorics. Because of all that Schoolaboratory 002 was hive of intergenerational cooperation and neighborly solidarity. Diploma award night made schoolyard the loudest and bustiest hub in Ledine.